Sushi Maven Premium White Rice 50 lb. 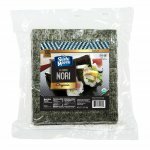 [SMWHTE] - $45.75 : SushiMaven.com, Your Source For Everything Sushi! Home > Sushi Rice & Noodles > Sushi Maven Premium White Rice 50 lb. Sushi Maven Premium White Rice 50 lb. The Sushi Maven Medium Grain Rice is shorter and plumper than regular long grain rice. Whereas the long grain rice stays separate when cooked, the medium grain sticks together making it perfect for sushi use. Medium grain white rice is more tender and delicate than brown rice. Packed In A 50 Lb Bag.